Bamboo begins life as a flowering plant that grows in many continents across the world. After one year when the soft bamboo has grown to its maximum height and it turns to the dry and hard material we recognise it as, it is cultivated, harvested, and then used to produce natural and beautiful pieces of home furniture we identify with today, including wonderful window treatments. Most often we see bamboo used as some form of blind, usually a roller blind. The lightness of bamboo and its gorgeous neutral shade makes it the perfect addition for homeowners in warmer climates who want to make the most of the summer sun and bridge the gap between indoor lifestyles and the great outdoors. Because of bamboo’s gorgeous neutral shading, it can complement almost any colour palette and be a stylish addition to any homes that need a natural touch. The most fabulous thing about bamboo window treatments is that bamboo is a natural product, and used in the same shape exactly as it is found. It’s not fully tessellating, which means that small rays of light can still enter through your windows between the bamboo pieces. If you’re looking for a translucent window treatment that will give you enough privacy but won’t prevent you from maximising the amount of heat and light coming into your home throughout the year, bamboo window treatments could be an ideal alternative to traditional window treatments and blinds options. Bamboo also feels light and won’t cause much discomfort if you want to open and close your bamboo blinds multiple times a day – whilst other window treatments can be a struggle to open and close. Shades of bamboo differ from product to product, depending on the type of bamboo you purchase and the way it has been treated. Bear this in mind when you purchase your blinds, as a shade too light or dark can become too anonymous or impactful in your home, or a tone that is slightly too warm or dark can upset the balance of light and colour you've worked hard to achieve. Bamboo window treatments also come in a range of standard sizes, and can be cut bespoke, so you don’t have the worry about finding the perfect match for your home. If you want a real personal touch, there is nothing to prevent you from grabbing your paintbrush and giving your bamboo window treatment a great splash of colour! Bamboo also gains style points because of its unique texture. It really is like no other natural surface. Bamboo often comes into our homes already treated, so it’s smooth and glossy with rough edges and knots that give it real character and personality. 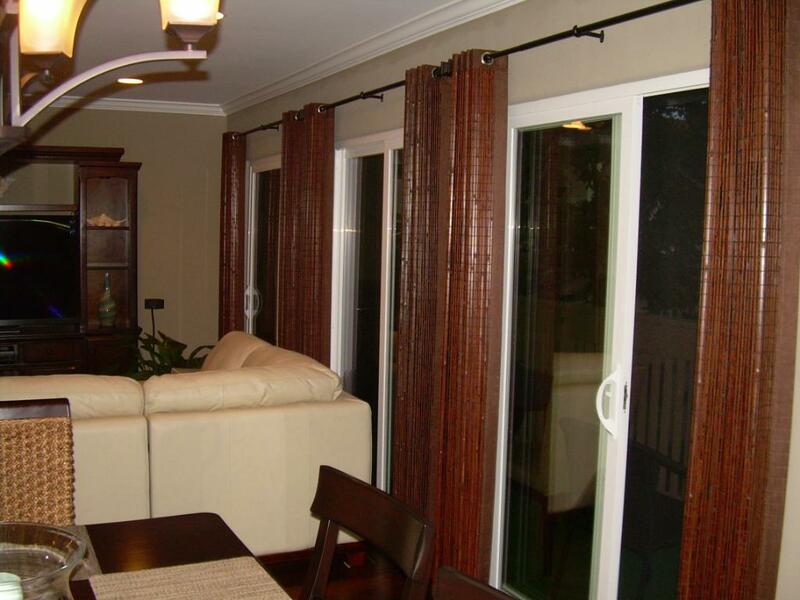 No two bamboo window treatments are alike, right down to the finer details, and it really is the perfect union of great quality and low cost that we very rarely experience. Although bamboo is a much stronger and rigid material that most fabric used for drapes and an alternative to typical voile and chiffon fabrics. That being said, bamboo will give a really unusual and striking style of drape that is still permitted to flow thanks to lightweight and thinner rods being used that what you might see in other pieces of bamboo furniture. 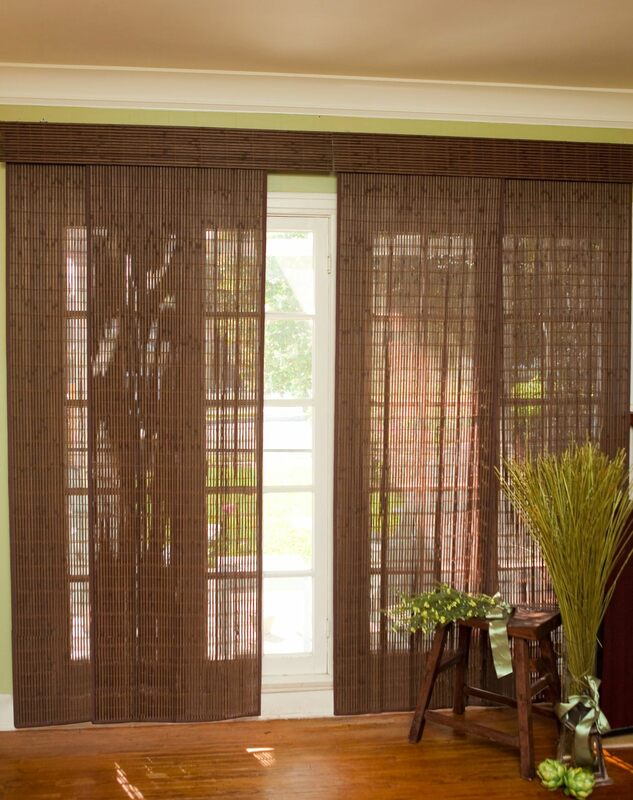 Straight bamboo will create a blind-like drape effect that falls straight and covers your entire window or door. Other choices available are more flexible and can be drawn back like a traditional drape or curtain. Finding the solution between style and function is one of the most difficult challenges any home owner undertaking an interior design project can encounter. 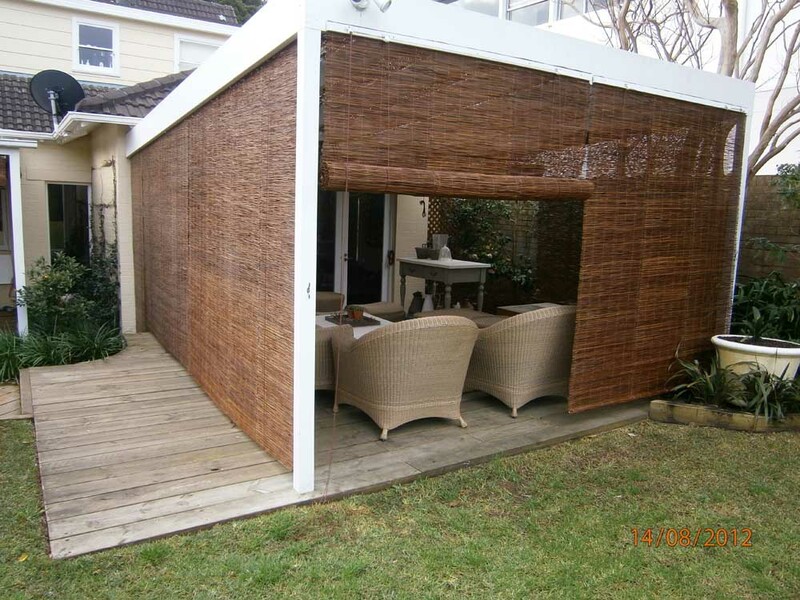 Although bamboo shades are a great asset to the style of any home as a high quality and cost-effective feature. One key quality of bamboo shades is that they won’t block out all of the light. In some respects this is a positive feature, but for some designers it can be counterproductive. Luckily, there are blackout bamboo shades available so that you never have to decide between a good night’s sleep, and making your home look completely fantastic. 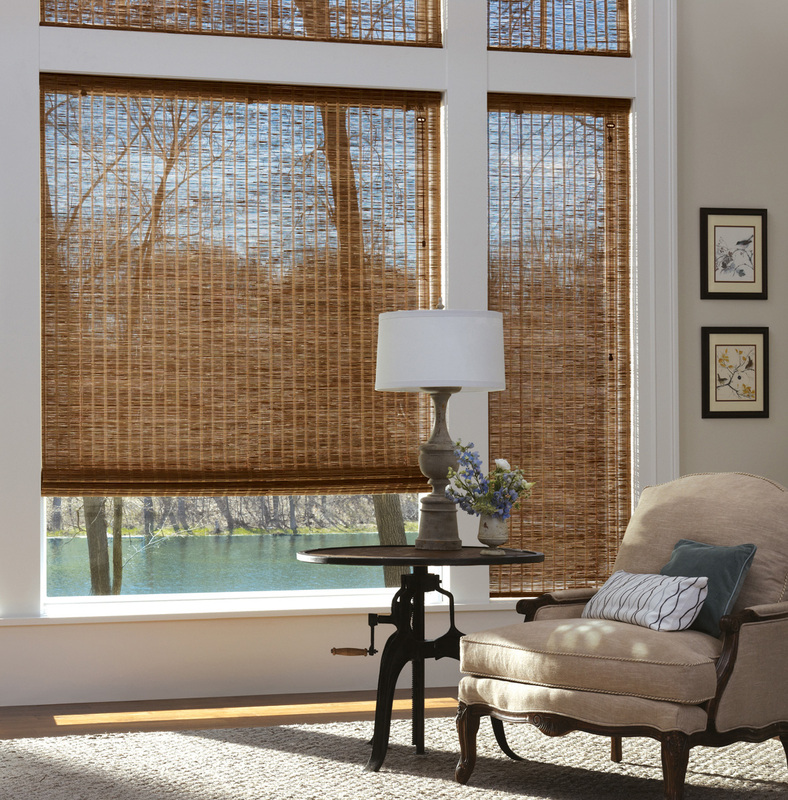 If your style is minimal and you require your window treatments to be in their simplest form, choosing cordless bamboo shades could be the seamless and fuss-free option you need. Without any added fuss or treatments, bamboo shades can create a wonderful timeless vibe with no frills or fancy additions. Cordless bamboo shades will allow you to maximise your simplistic and minimalistic style, while making your home a safer place – an important consideration if you have little ones! Today almost any blinds and shades are available in cordless options, making our everyday lives simpler and our homes much more comfortable. 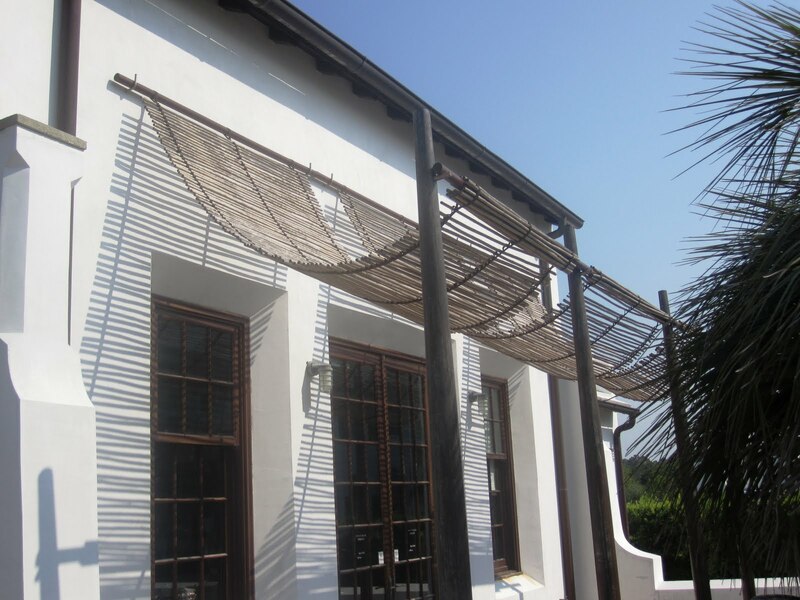 The most typical kind of bamboo blinds come as horizontal blinds, often roller blinds or Roman. However, if you want something that adds height to your room instead of width, you’ll be happy to know that bamboo vertical blinds are also available. These add an unusual sturdiness to vertical blinds, often built from translucent fabrics that are soft and drape well. What we adore about these is how they can add fun texture and exciting straight lines to the home without creating a fortress-like atmosphere. Although more rigid, bamboo vertical blinds will still allow your home to soften with great use of natural light and warmth. A lot more maintenance is needed with roll up blinds – they require more time to roll up or down than most other styles of blinds, so many people leave these types of blinds permanently rolled up at an ideal length – often in a room where light is needed and privacy isn’t a huge, issue such as the kitchen. 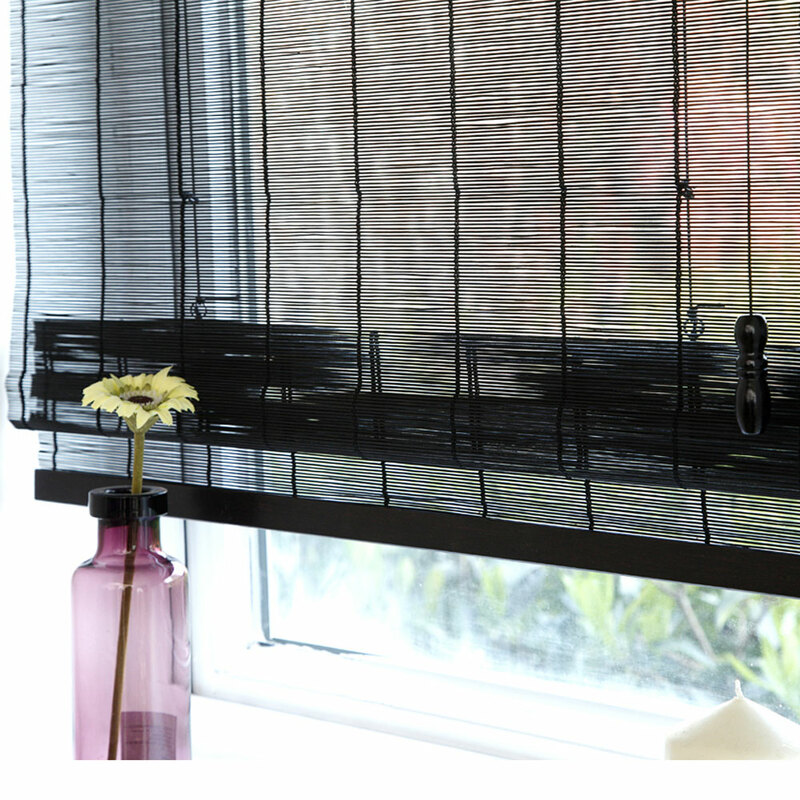 Ties on a bamboo roll up blind give the feature an added air of simplicity, suiting the organic and natural style of the blind and is a step away from the modern engineering of blinds with plastic cords and electrically operated blinds. 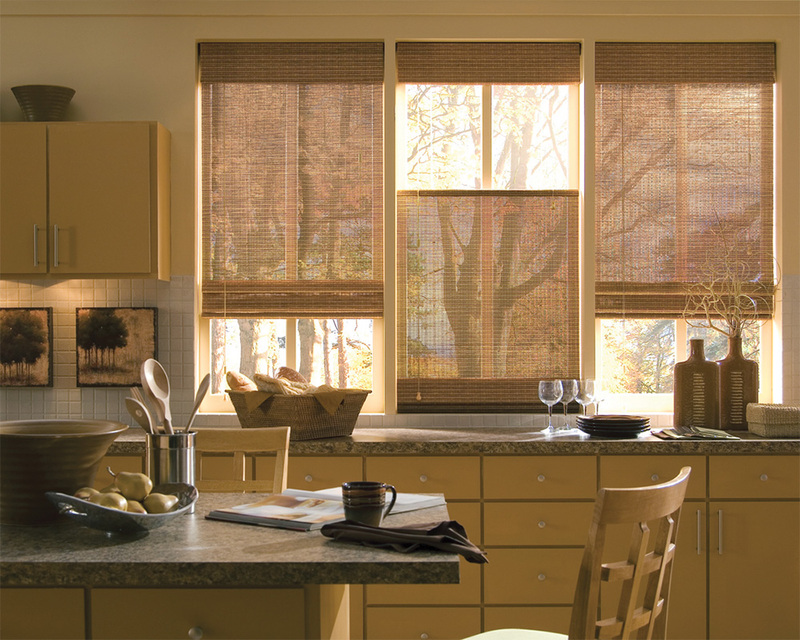 Blinds certainly identify as one of the world’s most popular style of window treatment. Aside from curtains, they are the treatment that gives us the most freedom with our personal styles, and can be adjusted as often as we’d like to give us more control over light and colour. With bamboo blinds, we gain the proven functionality of a good set of blinds in our home, but we also gain all the style and chicness associated with fun, natural and organic bamboo material. There isn’t a ‘one size fits all’ answer with bamboo blinds, there are many types available with many different features and styles. Bamboo Roman shades will combine charm and luxury with the neutral and organic style of simple and striking bamboo shades. Using smaller stems of bamboo, it’s possible to achieve a beautiful and soft drape. The bamboo will remain strong and although relatively low cost, will last for a while and prove to be fantastic value. 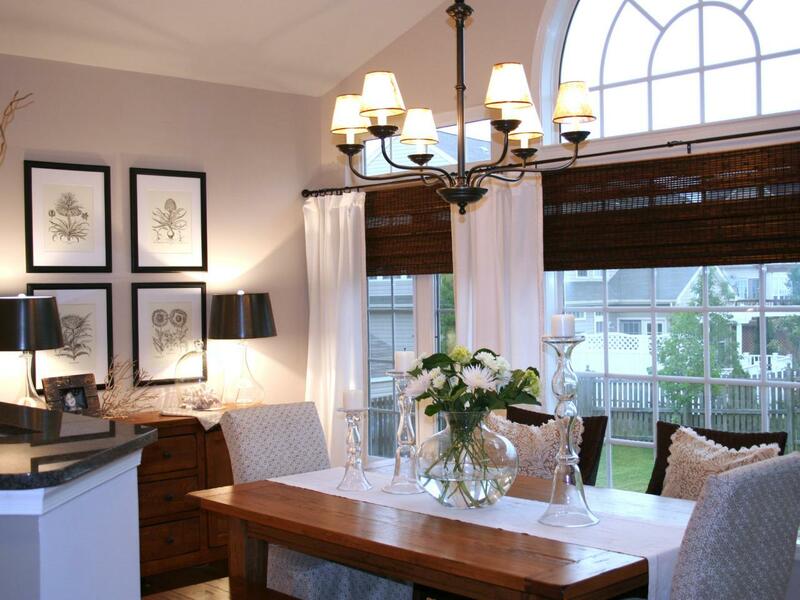 Bamboo Roman shades can also transcend interior design trends, meaning that no matter your tastes and how often they change, they can look fantastic against a range of home styles. What can be more perfect than relaxing, dining and socialising on the patio on a hot summery day? Not much! However, sometimes the sun can be just a little too much, especially midday in the height of summer. Keep your home cool on the inside by limiting the heat coming into the house with some bamboo patio shades, so you can keep your doors open for easy access to the kitchen and living areas. Bamboo is the perfect casual and informal material for patio shades, and is also a way to keep glaring sun from garden and patio areas without completely blocking the weather out. If you want your blinds to match your cool and collected colour palette perfectly, opt for white bamboo blinds instead of bamboo in its natural form. You can purchase white bamboo blinds ready-made, or you can give your own a makeover with a splash of paint. White is a fantastic colour for opening on homes and bouncing the light across the room to make your space feel larger and brighter. With unlined bamboo blinds, the light will seep through automatically and the balanced white shade will enhance the natural light. If you’re after something understated, a white backdrop will allow your brighter features to pop. As an alternative to traditional bamboo shades, woven bamboo shades use thinner pieces of bamboo and weaves them together to create a more opaque feature with a different style. Instead of the usual strictly horizontal or vertical style of bamboo, woven bamboo shades will give you more control over natural light inside your home and your privacy. It’s also much denser and has much more visual impact than its counter parts. If you’re a fan of pattern and prints, or you want something a bit more unusual than your typical bamboo shades, look out for those with woven panels. There’s no denying how great bamboo can look in the home and the benefits of using natural materials in interior design. However, genuine bamboo isn’t for all of us – sometimes the weight isn’t quite perfect, or the texture or colour doesn’t complement our homes as much as we’d like it to. Others don’t like the cracking that can occur with bamboo. 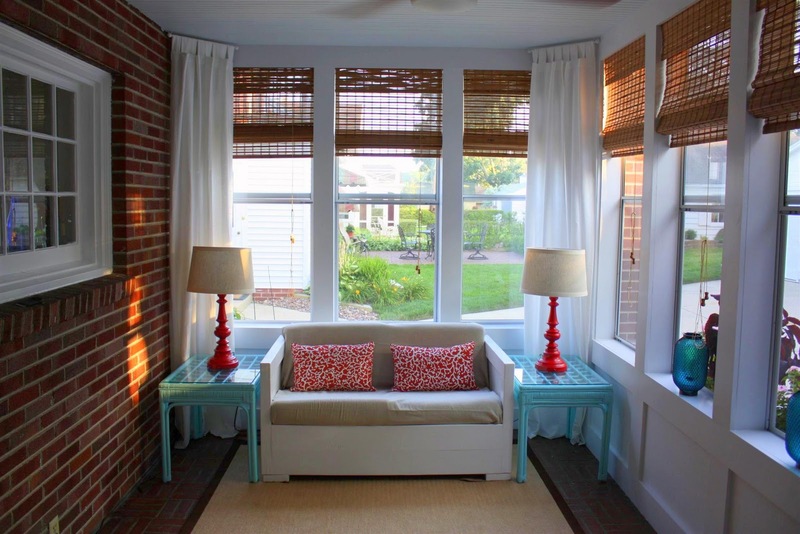 Thankfully, when it comes to bamboo window shares, there is an alternative in faux bamboo. 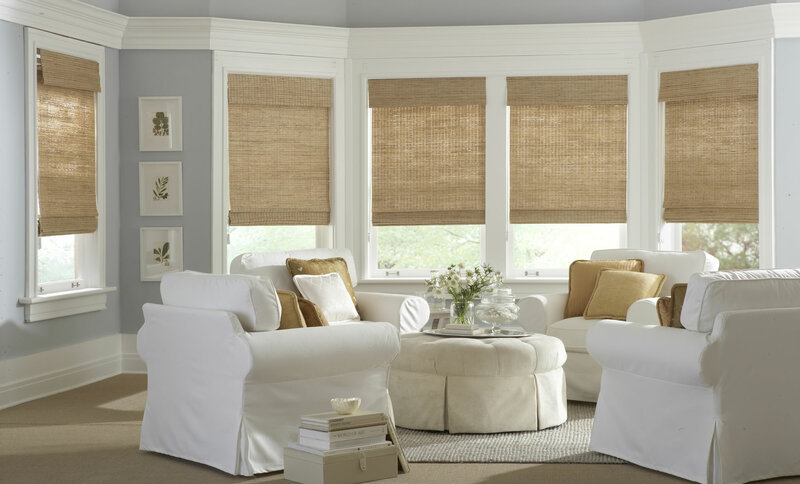 It is available in many of the same styles and from afar looks identical to the real thing, making faux bamboo shades are a truly great alternative. 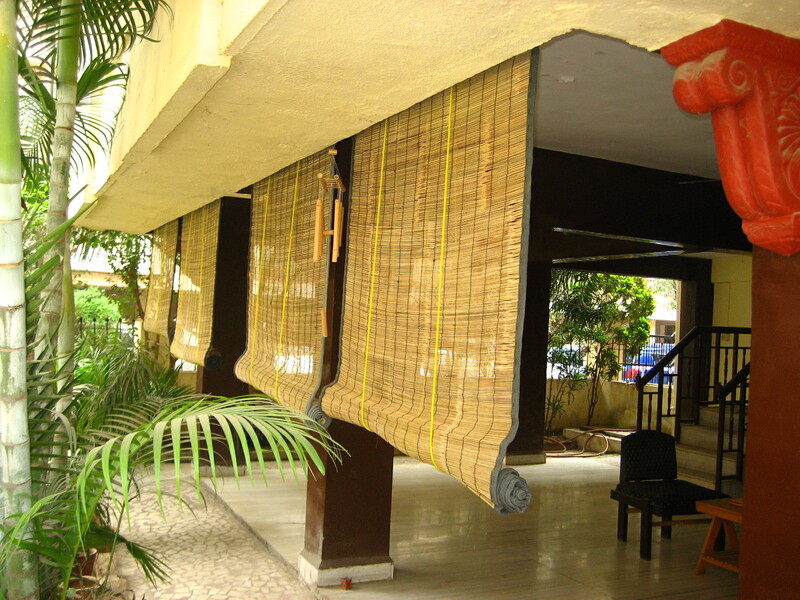 A quirky alternative to bamboo blinds, bamboo curtains can be an eye-catching piece. We usually rely only on fabrics to create curtains and on harder materials to create sturdier window treatments, such as blinds and sometime valances. In this instance, bamboo has proven its durability and flexibility by providing another option for interior designers. Bamboo curtains are the perfect balance for people who want something alternative and fun, but also natural, organic, and neutral. If you like bamboo blinds but you want something with a twist, explore your options for natural bamboo curtains. Roman blinds are completely timeless. When mixed with the understated style of simple bamboo materials, you get some really beautiful combinations. Because of the lightness and easy draping of bamboo blinds, especially thinner styles, they are almost perfectly suited to the drape and hanging style of Roman blinds. Bamboo Roman blinds are one of the best ways to add understated luxury, shape and texture to your home without breaking the bank. Heavier bamboo and wider blinds will have a much bigger impact on your interior décor, but softer blinds will provide a much more organic and simple style. Bamboo shades are available in a wide range of colours and styles, so it’s worth doing your research and shopping around to ensure you find the best match for your home, With different thicknesses, widths, and finishes, there are no two shades alike. 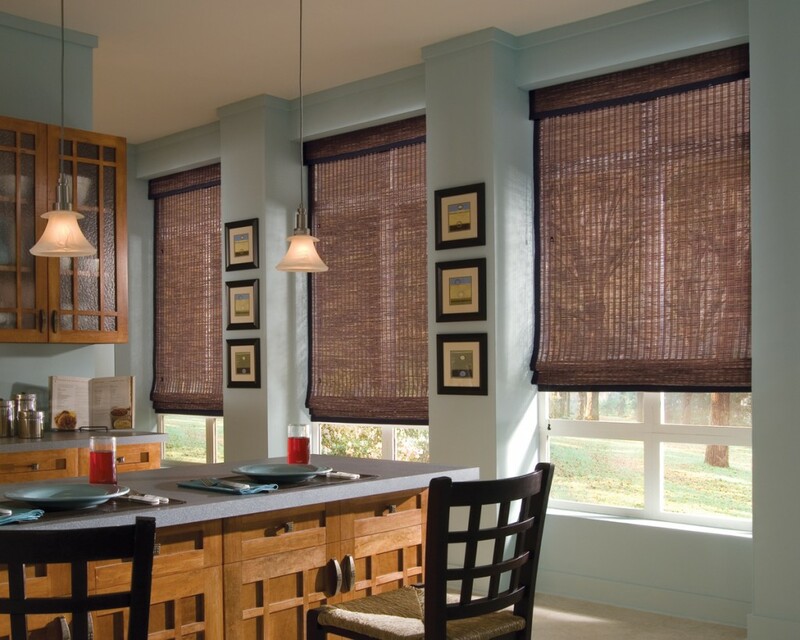 So, from room to room and even from home to home, the looks you can achieve with the help of bamboo shades can differ dramatically! For a clean, natural and organic look, bamboo blinds are the way to go if you want something that will provide a light and easy covering for any windows in your home. 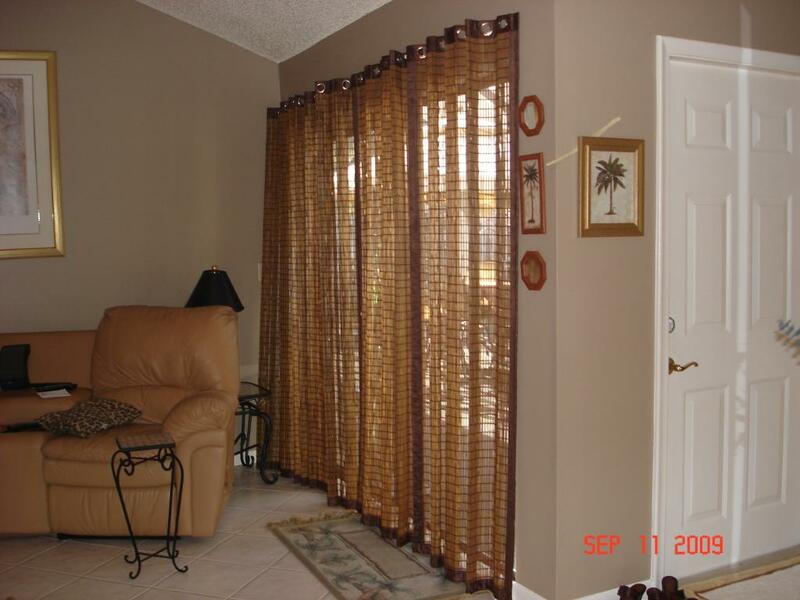 The great thing about bamboo window treatments is how although they provide us with privacy, some light and heat is still permitted to seep through and brighten our homes. But because all of our tastes are different and all interior design schemes have different requirements, there’s an answer to finding a different balance between the casual and natural style of bamboo shades, and the complete control you require over your privacy and your home’s lighting. A simple bamboo shade with a lining can solve your problems, providing a backdrop to your bamboo that creates a different look from the outside of your home and means you don’t have to sacrifice style for function. 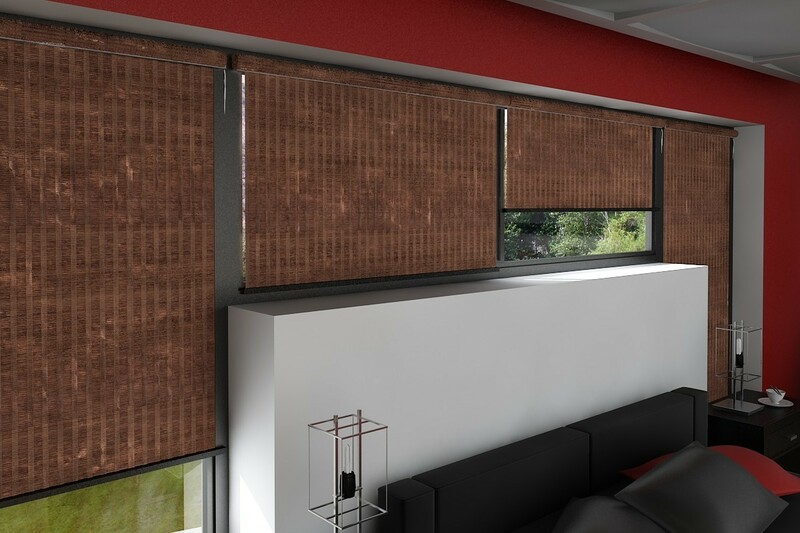 If organic and natural isn’t your style or you’d prefer a bamboo blind that packs a bigger punch, opt for black coloured blinds instead of the natural and simple bamboo tones. If you live in a cooler climate or would like to maintain more heat inside your home, black blinds will help you hold onto that warmth but the qualities of the bamboo mean that painting your blinds black won’t be too harsh as natural light and heat will still be allowed to enter through your windows. Black also has more of a visual impact, so if you need something with more oomph than neutral tones, think about giving your bamboo blinds a splash of paint. Manmade blinds and materials in the garden can look unsightly and unnatural. Why spend time preening our gardens only to disrupt everything beautiful and natural? Adding outdoor bamboo blinds to your patio doors will let you hold onto that natural and organic style you want to hone in your outdoor space. Bamboo looks and feels natural, isn’t heavy and bulky like steel, and is durable enough that it shouldn’t damage unless exposed to extreme weather. It’s also inexpensive, so you can update is often without any significant expense. 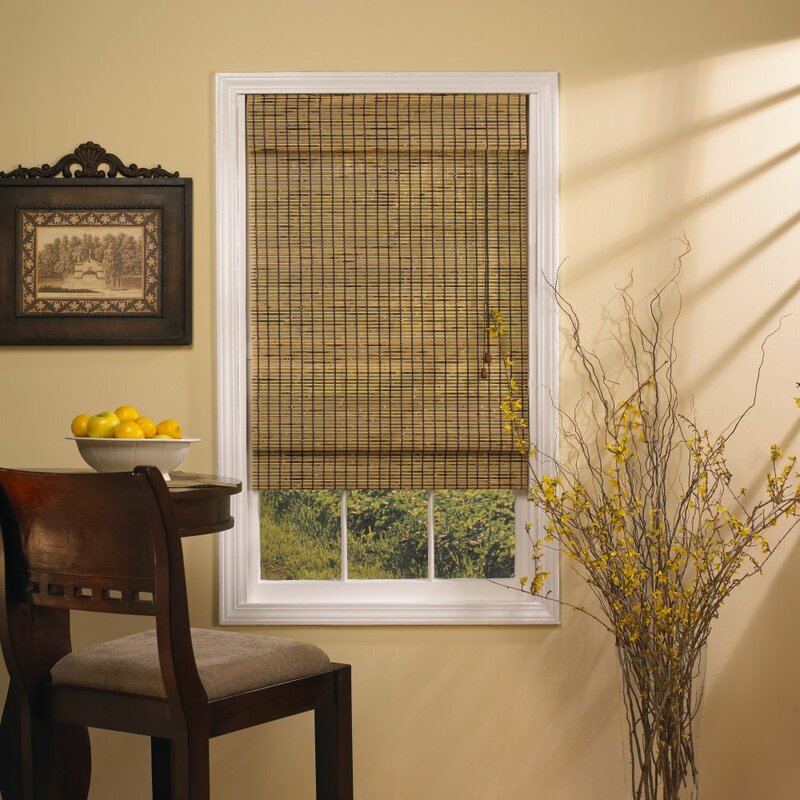 Bamboo blinds will provide shade, but won’t block out the sun entirely, giving you the best of both worlds. Bamboo matchstick blinds are the popular style of bamboo blinds made from very thin strips of bamboo that give the blinds much more softness. 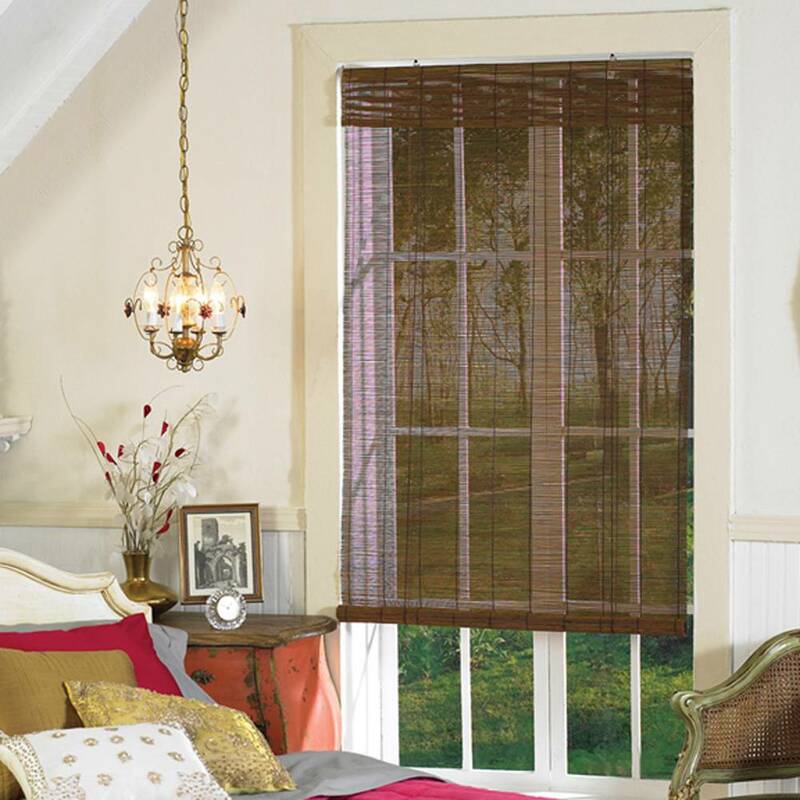 These are the blinds that will let a lot of light into your home, but will give you enough privacy. They can be rolled up easily due to their thinness and won’t give your home the same rigid and structured feeling that can sometimes be achieved with thicker and harder bamboo. Faux bamboo matchsticks are also available, often made from thinner, cheaper wood which is a great low budget option, but won’t give you much longevity. Bamboo is an inexpensive material to work with and so it’s easy to get a hold of. 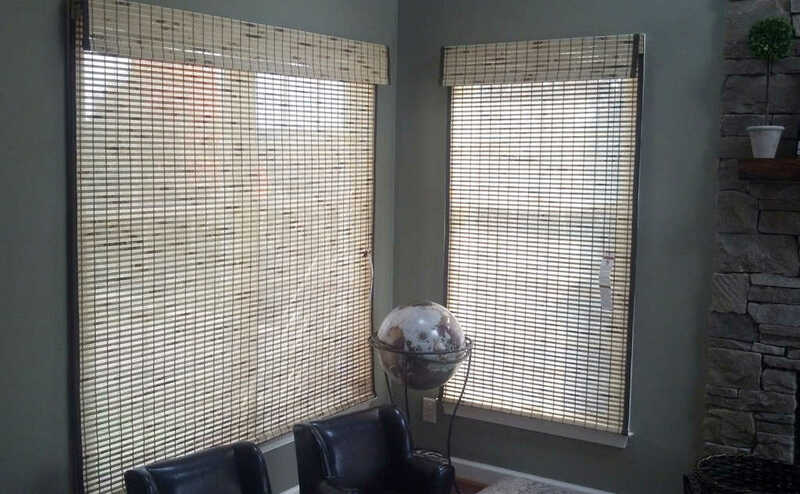 Although many bamboo shades are created to fit standard size windows and doors, it is possible to get custom bamboo shades that won’t cost the earth, as can often be the case with alternative bespoke window treatments. With custom bamboo shades, you can have more of an input on the thickness of the bamboo, the length as well as the width of the shades, and the colour and style of bamboo used as the main material. 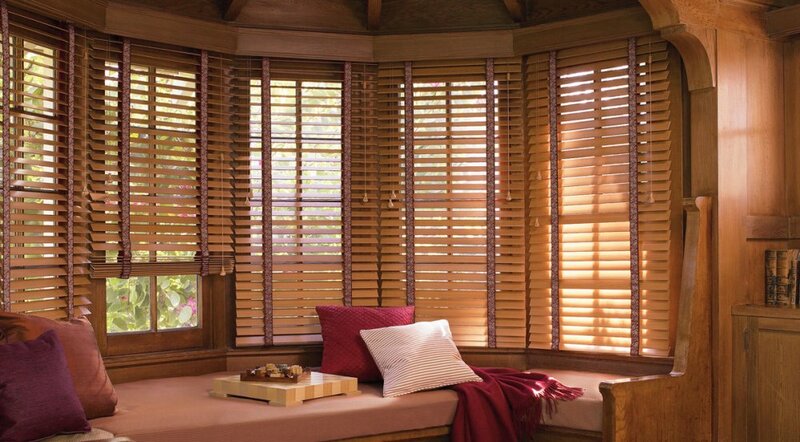 If your bamboo shades will be a key feature of your home, it’s well worth exploring custom options. 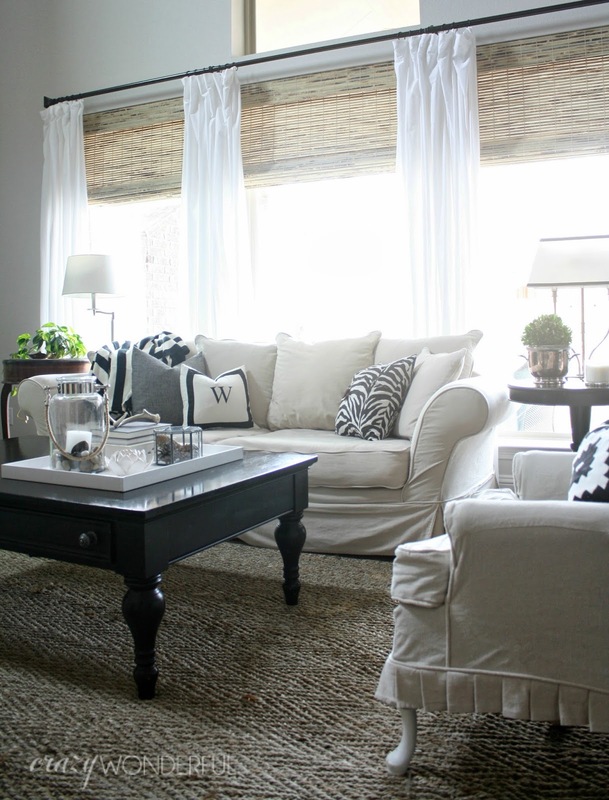 When it comes to window treatments, less isn’t always more. 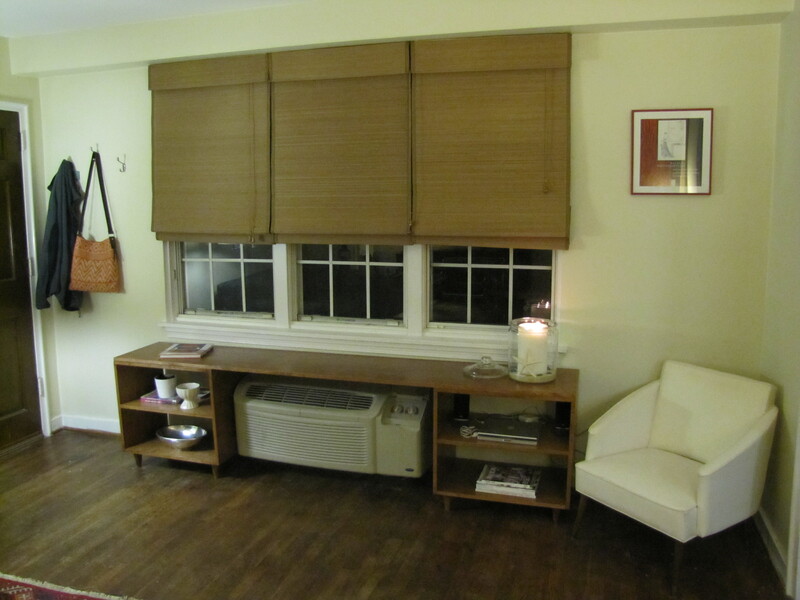 It’s a popular choice to combine blinds with curtains, but what happens when you have your heart set on bamboo blinds? A great set of curtains with lots of shape and drape can cause a real contrast with the minimalism and simplicity of the bamboo. While bamboo blinds create a great feature within the window frame, curtains can frame both the windows and the bamboo to create a bigger feature with more impact. Changing your curtains from time to time is simple, and will completely refresh how your bamboo blinds look and feel.